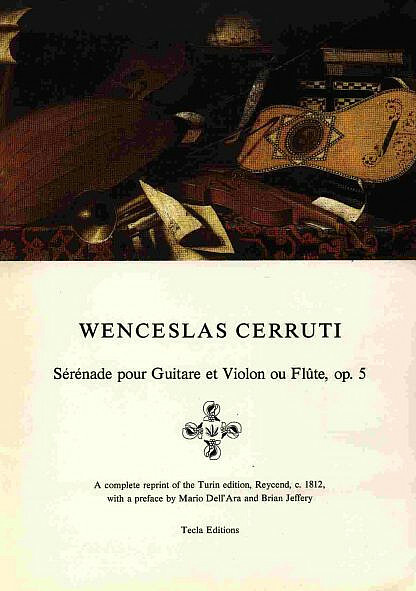 Wenceslas Cerruti’s Serenade op. 5 for flute or violin and guitar is from early 19th century Italy, a lyrical, flowing, and technically undemanding chamber work with guitar. This is an ideal piece for easy performance. There are two movements: an Andante sostenuto leading into Allegro. Reprint of the first edition of Turin, c. 1812. Parts only, no score. The preface in Italian and English by Mario dell’Ara and Brian Jeffery is in Italian and English. First published by Tecla in 1985.